LOS ANGELES -- Everytime I flip my calendar and stare at the month of June, I think about blushing brides and happy weddings. I think about sunny days and sweltering summer nights. I also think about the Lakers playing in the NBA Finals. But after three straight Junes, there will be no Lakers in the Finals this year. Physical and mental fatigue, advancing players' age, and internal turmoil helped put an abrupt end to LA's bid for a 3-peat. And yes, it also rained 3s in Dallas. So where do the vanquished Lakers go from here? Whether they tweak, tinker or totally implode their entire lineup is for GM Mitch Kupchak to decide. It's a matter for fans to debate and speculate, for experts to probe and analyze. Only one thing is certain: it's going to be messy. It's like peeling an onion, which simply results in the surfacing of more layers of onion. In the end, it hurts and you just get a pair of teary eyes. As shown by their early playoffs demise, the current Lakers are plain tired. After winning the Western Conference title thrice and the NBA championship twice in the last three years, the Lakers played an extra 77 games on top of the 246 regular season games during that span. That odyssey clearly drained both their minds and bodies, including Zen Master Phil Jackson, who chose to retire and fish in Montana than coach and teach the Triangle in LA. 1) Kobe Bryant --- This Black Mamba didn't have much bite this postseason. He seemed disinterested and disengaged. Some would even argue that he had lost the quick in his step, or the high in his jump. Kobe makes $24.8 million of the Lakers' league-topping $91 million payroll. At 32, Bryant is still the face of the franchise and putitng his name in the same sentence with the word "trade" would be a sin. 2) Derek Fisher --- Generously listed at 6-foot-1 and 210 pounds, this undersized guard got by in the NBA for 14 years using his smarts, speed, and strength. The president of the players' union, Fisher is still smart, but at age 36, he has slowed and weakened. The Lakers need a new steward at point guard. One who is younger, faster and stronger. One who can keep up with the Russell Westbrooks and JJ Bareas of the West. 3) Pau Gasol --- He played the worst among the Lakers. His scoring, rebounding and passing all declined like the stock market. The 7-foot, 250-pound Gasol made $17.8 million this year and he didn't seem to earn it. Maybe a change of scenery would reenergize the 30-year old Spaniard. 4) Lamar Odom -- His numbers also dipped, but not nearly as hideous as Gasol's. Now 31 and a budding reality TV star opposite his gorgeous wife Khloe Kardashian, Odom isn't ready for Hollywood fulltime just yet. At 6-foot-10, 230 pounds, Odom remains one of the more versatile big men in the NBA. And he's a bargain at $8.2 million a year. 5) Andrew Bynum -- He obviously didn't read the manual on how a Laker manifests himself with class and professionalism. He has a history of violence, two suspensions and one bad apology that someone apparently wrote for him to say. But he is 7-feet tall and quadruple large at 280 pounds. Bynum, 23, had a spectacular playoffs run, averaging 14.4 points and 9.6 rebounds per. He makes $13.7 million a year. Despite his thuggish behavior --- he viciously and maliciously clotheslined JJ Barea, a guy he outweighed by 110 pounds --- the Lakers will keep Bynum because you can't just replace a giant by going to Aisle 7 at Walmart. 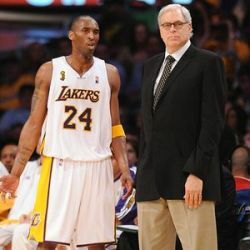 AFTER the Lakers sort out which player is staying or going, there is also a coaching matter to attend to as well. And that, folks, is a story for another day. Meanwhile, you have all summer to wonder what shake-up the Lakers will do.